Be the first to share your favorite memory, photo or story of Vanessa. This memorial page is dedicated for family, friends and future generations to celebrate the life of their loved one. Dana-Vanessa Ann Gossett, 26, of Dana, Indiana passed away at 8:53 am Tuesday, November 20, 2018 in the Emergency Room at Union Hospital, Clinton. 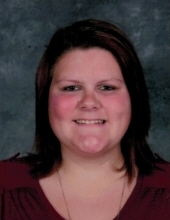 She was a 2011 graduate of South Vermillion High School, graduated with an associate degree from Ivy Tech Community College and was a senior at Indiana State University. She was born April 2, 1992 in Clinton, Indiana to the late Jerry Gossett and Shari Davis Gossett. Survivors include her mother of Dana; paternal grandmother, Janice Deffenbaugh and several aunts, uncles, and cousins. She was preceded in death by her father, maternal grandparents Earl and Jackie Davis and paternal grandfather Frank D. Deffenbaugh. Services will be 1:00 pm (Indiana Time) Saturday, November 24, at Overpeck-Gooch Funeral Home, 287 Main Street, Dana will the Rev. Marvin Miller officiating. Visitation is from 11:00 am until 1:00 pm Saturday at Overpeck-Gooch Funeral Home. To send flowers or a remembrance gift to the family of Vanessa Ann Gossett, please visit our Tribute Store. "Email Address" would like to share the life celebration of Vanessa Ann Gossett. Click on the "link" to go to share a favorite memory or leave a condolence message for the family.